The Indo-Aryan Mons from across the Himalayan range, the Darads from the extreme western Himalayas, and the Nomads from the Tibetan highlands were the earliest inhabitants of Ladakh. Rock carvings found in many parts of Ladakh show that the area has been inhabited from Neolithic times. 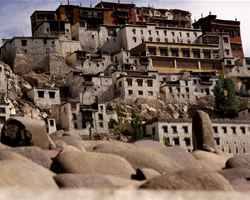 Buddhism spread into western Ladakh from Kashmir in the 2nd century. Farming was introduced to Ladakh by the Darads and Baltis of the lower Indus Valley, while the wandering nomads from Tibet brought the skill of herding to Ladakh. An independent kingdom of the 10th century, Ladakh was continuously pestered by the periodical attacks of the Kashmiri Muslims in the 16th century until it was finally annexed to their state in the mid-19th century. One can see diverse influences of the different people in the Ladakhi culture. The proximity to the valleys of Kashmir, Kishtwar and Kulu resulted in the mutual influence of culture and ethno types in between Ladakh and those regions. The kingdom expanded most in the 17th century under the wise rule of king Sengge Namgyal, his empire stretched across western Tibet and Spiti all the way to the Mayumla situated beyond Mount Kailash and Lake Mansarovar. During this period Ladakh gained fame as the best trade route between Central Asia and Punjab. The merchants traveling through these routes periodically dealt in raw silks, carpets, textiles, spices, narcotics and dyed stuffs and Leh, served as halfway rest house for them. The popular means of transport was on foot or on horsebacks. The vehicles are in use since the 1960s when the Srinagar- Leh motor-road was constructed. However, the most profitable trade of the region remained the making of the world-famous pashmina (better known as cashmere) shawls known for their exceptional softness, delicacy and warmth that were created in the high altitudes of western Tibet and eastern Ladakh and were transported to Srinagar via Leh. The irony is that it is this very trade that attracted the greedy eyes of Gulab Singh, Jammu’s ruler to this independent kingdom resulting in a decade long war and turmoil. But later, with the emergence of the East India Company, the whole region was taken over by the British. At the time of British Empire, Ladakh was the Princely State of the Dogra, Ladakh and the neighbouring province of Baltistan were incorporated into the newly created State of Jammu & Kashmir.